Quality Painting - Hoods etc. Passing a thorough quality inspection. Achieving the best possible color match. We pride ourselves on outstanding color match. No colors are too difficult to match; some only require more time and patience. All colors must be test sprayed, checked and tinted for precise match prior to the vehicle entering the spray booth. Color matching is an art and our paint technicians are true artists. In the absence of a factory a paint code for a vehicle, we utilize DuPont’s Acquire color match camera. This high tech digital camera links to our DuPont computer to create a color formula where one does not exist. 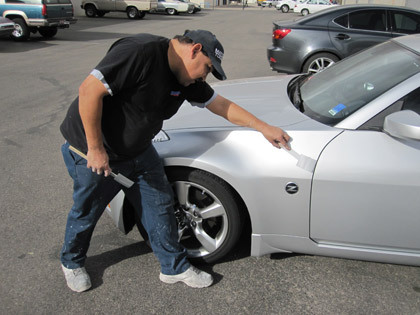 Once the vehicle has been sprayed, the finish is treated to a high temperature bake cycle to ensure proper paint curing. As stated in our warranty, our finishes are guaranteed for the life of the vehicle.